Move over, Cinderella. 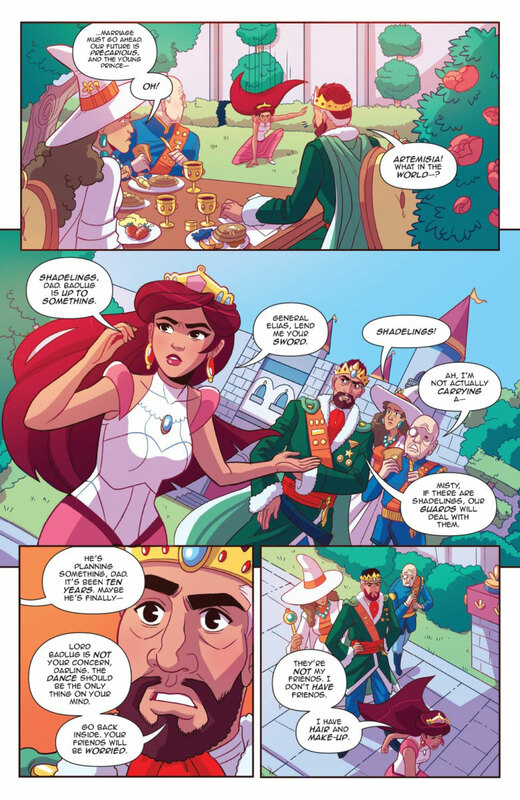 We have a generation of princesses now that are more than happy to start saving themselves. 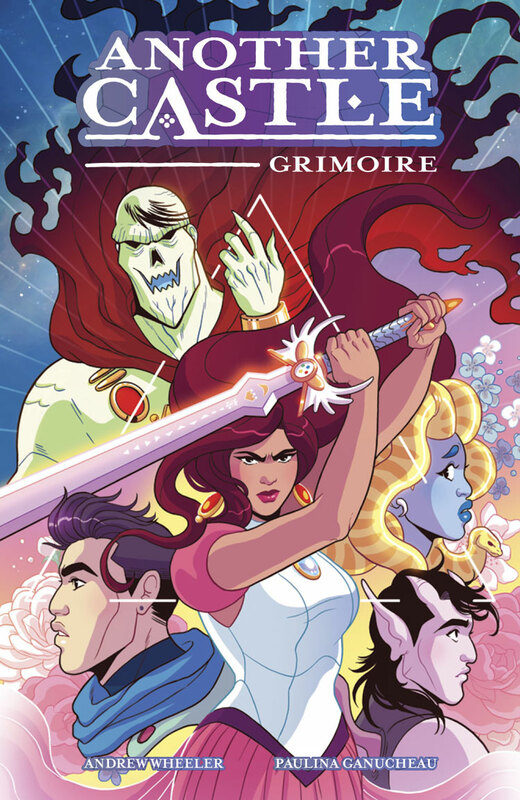 One of those daring debutantes is Princess Misty from the Oni Press mini-series and now graphic novel, Another Castle: Grimoire. On hand to share their thoughts on developing the series are writer Andrew Wheeler and artist Paulina Ganucheau, who walk us through development of the series, its character design, and how public reaction to the series has been. Matt Santori: Congrats on the series, Andrew and Paulina, and on the collection arriving in stores everywhere! 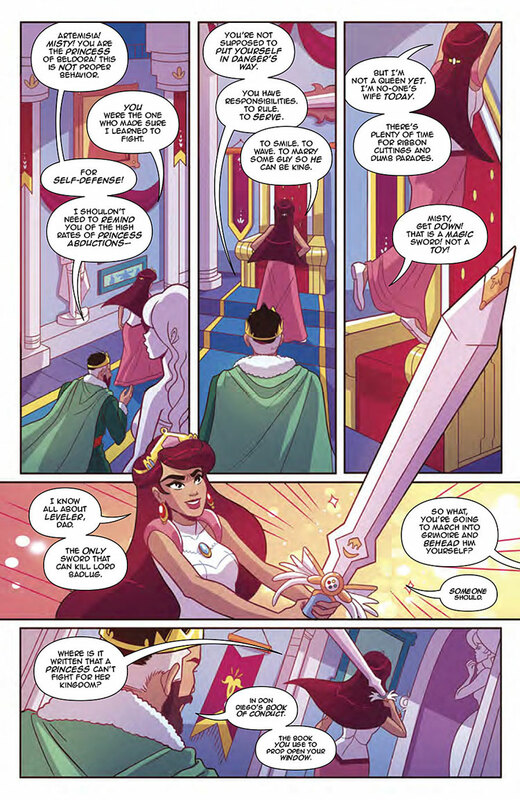 How did the initial idea come about for Princess Misty and the role she’d play as hero in the title? Andrew Wheeler: Thanks Matt! The whole idea started with my frustration at the way women are presented in video games as “trophies”, so you would see glimpses of her in a cut scene, but you’d be playing as a male hero, fighting through waves of villains. Well, doesn’t that woman have an internal life? Doesn’t she have a story? 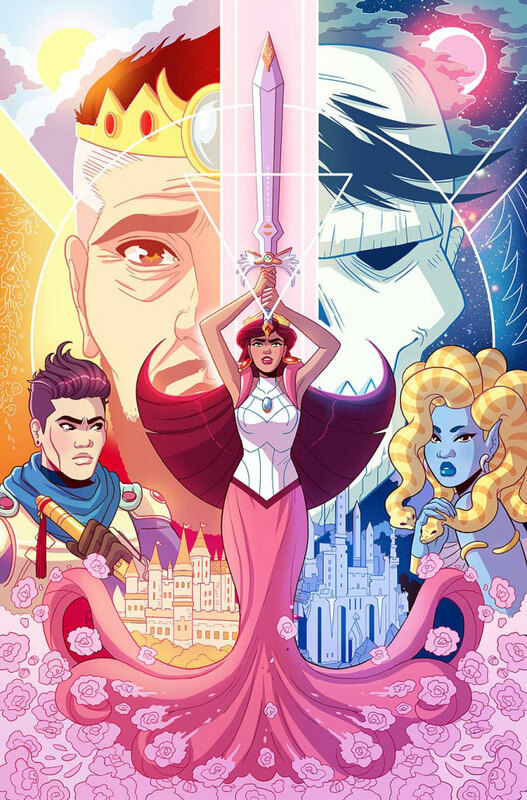 So I looked for a way to spin it so that the princess is actually the hero, bringing down the big bad guy, and the cutaways are to the dude with the sword who only thinks he’s the lead. I didn’t want to just swap the prince and the princess around; I wanted to show that everyone can be the hero of their story. MS: We’ve begun to reach this moment in our culture where the traditional princess story can no longer go uncritiqued. Where do you think Another Castle falls into the spectrum of discussion and what does it bring to the table that’s unique in that regard for you? AW: Right. We’re still seeing plenty of stories where women are treated as ornaments or damsels, or where women are restricted to a handful of roles, but those stories do get called out now. Even Disney is broadening its ideas about what a princess story can be. I know Another Castle is part of a landscape of progressive princess stories, but because I was writing one, I actually haven’t read the others; I didn’t want those stories to influence mine. I’m excited to dig into them now! But I set out to address the questions that matter to me, about what does and doesn’t define a hero, and what does and doesn’t represent a happy ending. 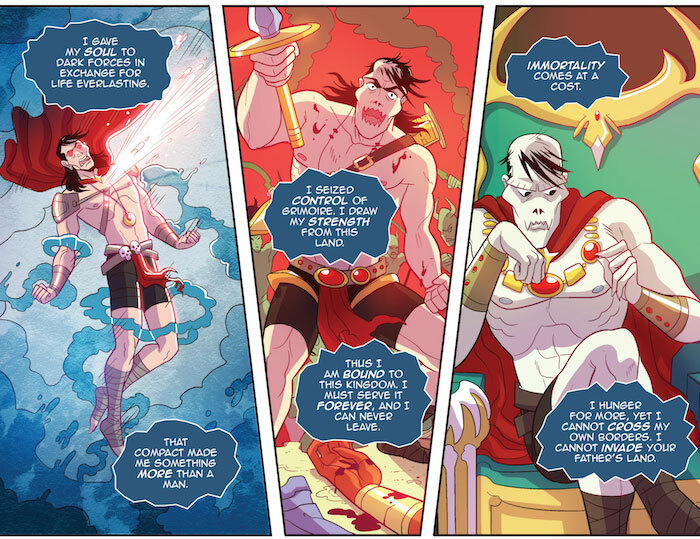 MS: The character design is super-playful and diverse for the book as a whole. How did you go about deciding on the look, feel, and color for the environment and its inhabitants? PG: I kind of played to my strengths with the designs and look of this book, but honestly when you’re working with YA you want to keep it accessible! I always make sure to ask myself, “What would a younger version of me want to see in a book,” and that’s bright colors and a cast that anyone can picture themselves a part of. MS: Princess Misty does ride this line between the haughtiness of a princess and someone much more determined and down to earth. What was your thought process on writing—and depicting graphically—her personality, and in particular how she related to the men in her life? AW: On the one hand, Misty needs to be tough and formidable to overcome the sheer weight of tropes and cliches stacked up against her in a fairy tale story. On the other hand, she still has to have flaws and vulnerabilities, and in this case, it was important to show that she could still benefit from listening to other people, learning from other people, and letting other people in. Her strength and her vulnerability both come from isolation, and she needs to adjust to being part of a bigger picture. Her relationship with men is defined by the fact that she’s destined to be a political pawn, handed off from one man to another “for the good of the kingdom.” She’s presented with a choice at the start of the story where her worst possible outcome and her best possible outcome both involve marrying a man she doesn’t love. She has to tear that whole thing down to get out of that binary. I couldn’t have her relying on straight men to do that. But we do have a straight man, Prince Pete, relying on her. 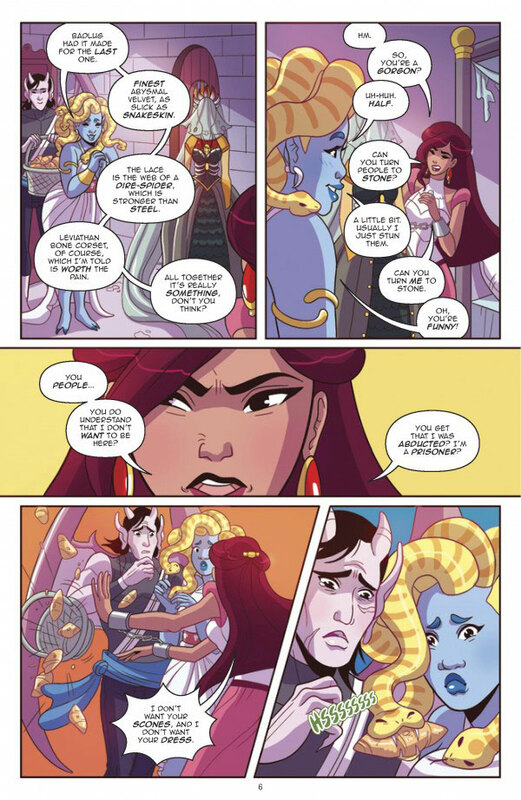 MS: Of all the characters, Gorga and Fogmoth stand out from the others, both visually and in their emotional connection to Misty right away. What were you hoping to achieve with each one throughout the story? PG: I adore them both. What sweet characters they are. I really fell in love with Fogmoth as I drew him more and more! Who’s not going to fall in love with a lavender gargoyle boy who loves to bake? I’m smitten. AW: Readers have responded so positively to those two, and I’m so glad! They’re sweet little babies who have led very sheltered lives inside this oppressive regime. 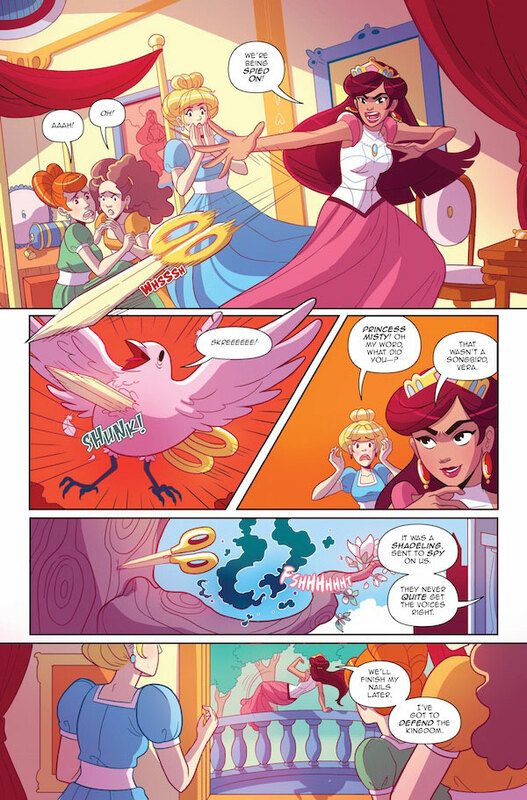 Misty disrupts their world, but she doesn’t change who they are; they’re good, loving, sweet people in a bad place, and they leap at the chance to be part of something better. They pass the test. And they’re monsters, of course. I’m very drawn to monsters, and that’s a big part of the story. If a knight is fighting a monster, we make assumptions about who the bad guy is and who the good guy is. I don’t like that assumption. MS: There’s no shortage of action in the book, too. How did you two work together to script/layout those more dramatic scenes? For instance, were the sword battles tightly scripted or left to develop on the page? AW: I think it’s part of a writer’s job to give the artist an option, but not hold them to it. The panel breakdowns are there in the script, but if Paulina has a better idea, I want to use that instead! The script is only the start of a conversation. PG: Andrew gave me such a strong foundation for the entire series. There was never a time where I felt I was unsure of what I should be doing. I think that gave me the chance to elevate what was already there with visuals! MS: Another Castle has been praised as an all-ages title, particularly by the ALA and librarians nationwide. Why do you think it’s been embraced so well and what steps did you take to ensure its message would reach as young an audience as it could? AW: I am so incredibly grateful to see that response from librarians and educators, because they’re at the frontline when it comes to building a better world, and I want this book to be part of their toolkit. I think we tried to make a book that as many people as possible could read and enjoy. So, no rude parts. Beyond that, I didn’t impose any limits, and I didn’t dumb anything down, and I think that’s why librarians are responding so positively. With Misty we made a point of saying she can fight and still wear pink; this whole book operates the same way. You can resist tyranny and stand up for freedom without being grim and miserable. You can be femme, queer, pink, and you can fight. You can be a princess. PG: Exactly. It’s all right there for everyone, it’s very earnest and it’s message is strong. MS: Any plans for future editions of Another Castle and for Princess Misty as her kingdom evolves past this initial adventure? AW: Another Castle is designed to stand alone; a complete story that someone can pick up and enjoy from cover to cover. There are no loose threads or cliffhangers. But I love these characters, and there are a lot more stories that we could tell with them, so if there’s demand for it, I absolutely know where we’d take Misty and her family of friends on a second adventure. It would of course involve… another castle. 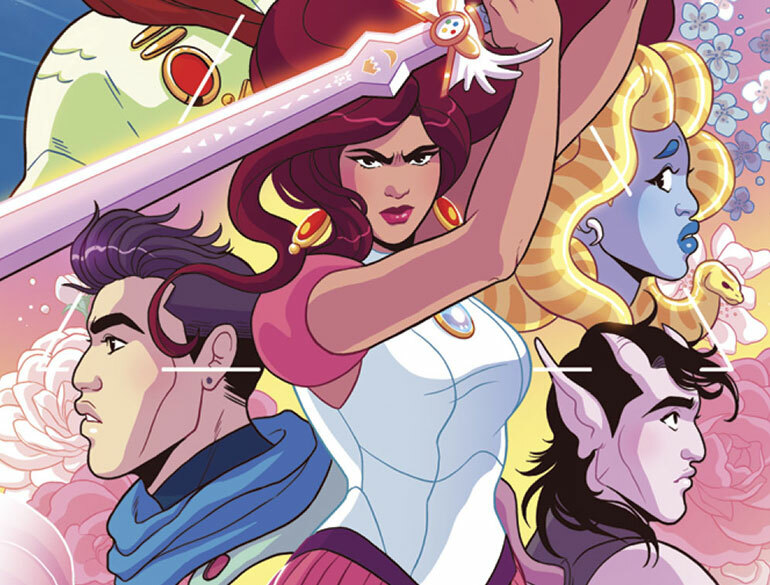 Oni Press’ collection of Another Castle: The Grimoire is now in comic and book stores, online, and anywhere else graphic novels can be found.